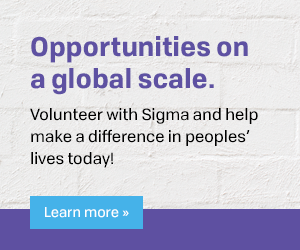 Get Involved: volunteer with Sigma. What is the Regional Chapters Coordinating Committee? The purpose of Regional Chapters Coordinating Committee (RCCC) is to facilitate the work of chapter leaders by advancing initiatives that meet the needs of the chapters and fulfill the mission of the Society. The RCCC is one of three standing committees of the Sigma Board of Directors. The Governance Committee and Leadership Succession Committee are also standing committees. The RCCC consists of 20 elected Regional Coordinators (RCs) and one elected chairperson. Please email chapter services or call 888.634.7575 (US/Canada toll-free) or +1.317.634.8171 (International).